Biological weapons are not weapons of mass destruction. They are weapons of widespread death. The recent bombing of a Syrian research facility by Israel has brought into our view once again the future of the Middle East as a place of continuing political, religious and ethnic conflict, and a place where the worst manifestations of scientific research may come to fruition. The facility in question allegedly trained people who worked on biological and chemical weapons. News and commentary on the subject of bioweapons usually fall under that easily understood no-no, “weapons of mass destruction.” The term itself raises the stakes of the conversation immediately, which is useful, but like so many useful terms, it also is a distortion of the past. What we call “weapons of mass destruction” are all heinous, it is true. But lumping them together misses an enormous distinction about their purpose. The atomic bomb, as horrific as it is, was conceived during World War II as an enormous explosive, one that could accomplish in a single bomb what weeks of bombing missions with conventional explosives would do. The yield of a weapon, in kilotons or (later with fusion weapons) megatons, was measured against the equivalent tonnage of dynamite. Don’t get me wrong, there are many effects of nuclear weapons that go beyond this: biological effects, geophysical effects, and long-term contamination. And I do not defend the scale of destruction in any fission or fusion weapon. But the atomic bomb was not designed to accomplish its debilitating radiation effects. When I looked into the details of these decisions, while writing Arming Mother Nature, it was clear that American scientists and military officers were quite aware of a major change in ethics that informed scientific research. Biological weapons existed to accomplish mass death. They were born of acceptance that a new world war would break out in the near future and that, like World War II, civilians would be principal targets. Was the decision to pursue biological weapons a heinous one? Maybe, but it was in keeping with military thought circa 1950. Biological weapons take their cue from nature. The factoid that all military history buffs know, but usually ignore, is that most deaths in any war are from disease, not fighting. So it was a simple decision: if the next war would focus on civilian casualties, why not find a way to enable the horrific episodes of the past? Today we read about bioweapons research labs, as if there are tons of new diseases being devised. But the open secret is that there just aren’t many “new” bioweapons. Until the onset of the AIDS epidemic in the 1980s, even the wildest fantasies about them involved the time-honored scourges: bubonic plague, smallpox, a variety of fevers, and the flu. Even more exotic possibilities, such as anthrax and botulinum toxin, were not new creations but simply creative uses of old threats. For military research establishments, the task was not to create new pathogens, but to figure out how they could be manufactured cheaply and put into a form that could be integrated into existing military technologies, such artificial smoke, airborne spraying, leaflet containers, and cluster bombs. Imagining biological weapons as the most legitimate and logical form of warfare requires us to paint a fairly grim picture of the past. But is it a false picture? The researchers and military planners knew they had crossed into a brave new world. It entailed a mentality that not only legitimized what World War II became, but also made it a new standard for the future. In the early 1950s, the U.S. Department of Defense convened a series of panels to figure out just what these weapons were good for. Bioweapons had the Joint Chiefs of Staff scratching their heads. They seemed so obvious as a weapons system, but what was the best one to pursue? Yersinia pestis offered the possible bonus of an epidemic, spreading bubonic plague far beyond any target area. When imagining a war against a foe with a giant population, such as China or the Soviet Union, this had some appeal. But in close quarters, fighting an enemy next door, bubonic plague would be just downright stupid as a weapon. The blowback potential would be immense. What these panels did conclude was that there was something that united three weapons systems: radiological weapons, chemical weapons, and biological weapons. All three were weapons of contamination, aimed at debilitating or killing people and animals, not destroying buildings or industrial capacity. Some liked the term CEBAR to describe these three. They all aimed at biological death. They were different from nuclear weapons, which everybody knew would level a city. The legitimacy of nukes was in question because of its scale. Blowing things up, as the U.S. interest in the MOAB (Massive Ordnance Air Burst, or the “Mother of All Bombs”) during the Iraq war showed us, does not raise eyebrows in the same way that killing—and only killing—does. The term “CEBAR” did not stick, though, and in the next decade military planners ignored the differences and simply classed them all as “NBC” weapons. Nuclear, biological, chemical. Erased was the radiological weapon, i.e. the “dirty bomb,” which used nasty stuff like radioactive waste to contaminate an enemy. By grouping these weapons systems together, they have, by inertia more than by logic, continued on as “weapons of mass destruction.” Or just WMDs, a full erasure of distinctions. They have symbols that most people recognize, and mostly we just know they are really, really bad stuff. 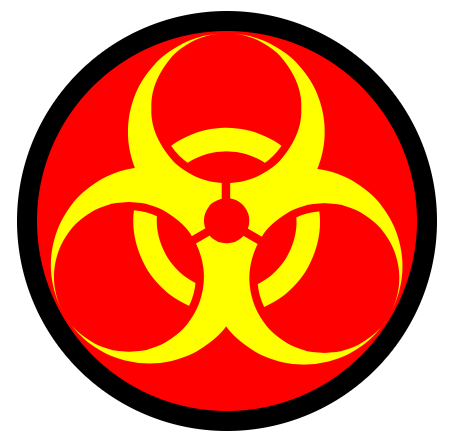 Biological weapons and chemical weapons, like radiological weapons, are made for killing (“they ain’t no good for nothin’ else”). They are best used against large concentrations of people, i.e. towns and cities. President Truman’s scientific advisors once told him that weapons having no discernable military targets are actually weapons of genocide. Is there ever a legitimate use of a weapon of genocide? ← Can’t Historians Predict the Future?